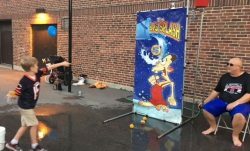 Central School PTO / 2018-19 / Another Great Family Fun Night! We hope everyone had a great time at Family Fun Night! Thank you so much to our Family Fun Night Committee: Aimee McNally, Marisa Kirsch, Kathy O’Bryan, Melissa Porter, Andrea Hall and Sarah Baker. Also, a HUGE thank you to our amazing teachers who donated their time to sit in the dunk tank or just pitch in overall! Thank you to Mrs. Valaisa, Mrs. Neal, Mr. Weston, Ms. Stephens and Mrs. Gomez. Let’s also not forget Mr. Gatz who sat under that bucket of water for well over an hour! We love our teachers and principal!